Not yet available for preorder. Please check back soon. John Dewey’s Experience and Education is an important book, but first-time readers of Dewey’s philosophy can find it challenging and not meaningfully related to the contemporary landscape of education. 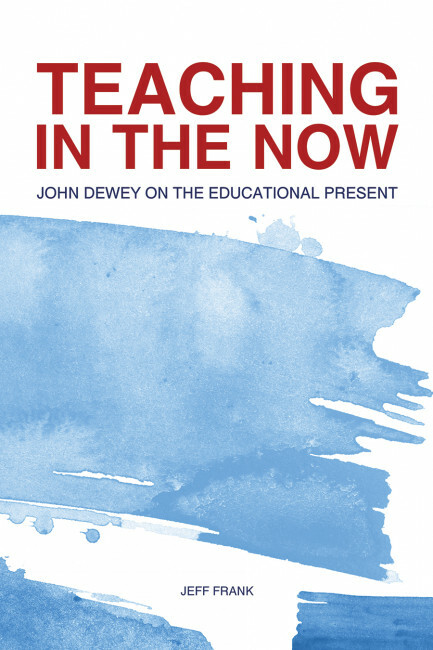 Jeff Frank’s Teaching in the Now aims to reanimate Dewey’s text—for first-time readers and anyone who teaches the text or is interested in appreciating Dewey’s continuing significance—by focusing on Dewey’s thinking on preparation. Frank, through close readings of Dewey, asks readers to wonder: How much of what we justify as preparation in education is actually necessary? That is, every time we catch ourselves telling a student—you need to learn this in order to do something else—we need to stop and reflect. We need to reflect, because when we always justify the present moment of a student’s education in terms of what will happen in the future, we may lose out on the ability to engage students’ attention and interest now, when it matters. Dewey asks his readers to trust that the best way to prepare students for an engaging and productive future is to create the most engaging and productive present experience for students. We learn to live fully in the future, only by practicing living fully in the present. Although it can feel scary to stop thinking of the work of education in terms of preparation, when educators reclaim the present for students, new opportunities—for teachers, students, schools, democracy, and education—emerge. 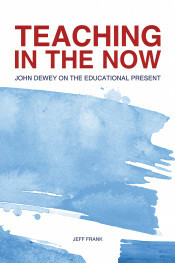 Teaching in the Now explores these opportunities in impassioned and engaging prose that makes Experience and Education come alive for readers new to Dewey or who have taught and read him for many years. Jeff Frank is a philosopher of education and teacher educator at St. Lawrence University in upstate New York. His articles have appeared in leading journals of educational research, like Educational Researcher and the Teachers College Record, and he has published widely in philosophy of education journals, focusing on American philosophies of education and the intersections of philosophy and teaching. He is a big believer that engaging with philosophical work can make a practical difference in classrooms, and Teaching in the Now is meant to show how Dewey’s work can improve the way we educate, and think about education, in our time.